Staying Away from The Vancouver 2010 Olympics? Forget It! Go! | What The Sooke? Staying Away from The Vancouver 2010 Olympics? Forget It! Go! I was one of those people before. I had no interest in taking the ferry to Vancouver and braving the crowds, lines and security to hang out downtown. What’s the big deal? I was wrong. I returned from Vancouver yesterday totally energized and excited about the Games. The city is simply buzzing with activity 24 hours a day. Yes it’s busy, yes it’s crowded, but that’s half the fun. If you’re complaining that the Olympics are a 2-week party for the rich, you’re dead wrong. I didn’t have a ticket to any events, nor a plan or a list of attractions I wanted to see. I spent next to nothing, but felt like I took in everything. And it couldn’t be easier for us in the greater Victoria area. BC Ferries has added an early morning (6:00am) and late evening (midnight) sailing for your convenience. Bus to or park at Swartz Bay terminal, walk on the ferry. Take one of the many buses outside the Tsawwassen terminal and get on the Canada Line downtown. Quick and easy. There might be a lineup, but with trains coming every 3 minutes or so, you won’t be waiting long. I never had to wait for more than one train before being able to get on. Wander around, explore. Take in some of the free entertainment at the various pavilions. 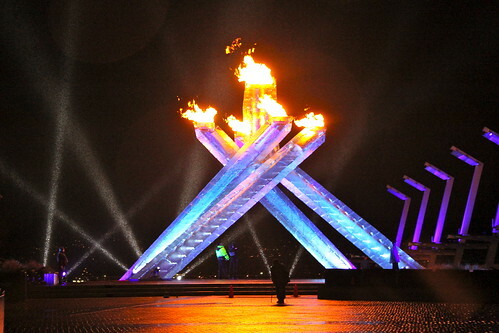 See the Olympic flame burning outside the convention centre. Feel the vibe and enjoy the spirit! Watch the events unfold from numerous outdoor high-definition screens. There really is nothing like it – standing on the street, cheering on our athletes with 1000 of your closest friends. Everyone is smiling, waving flags and having a great time. The Richmond O-Zone is great too. Just steps from the Richmond-Brighouse Canada Line station, this 60-acre site includes a large mainstage with free concerts all Games long, beer gardens, restaurants, arts and culture displays, the ever-popular Holland Heineken House, and BC Street, where you’ll find displays from all over our glorious province, enticing the world to come and visit. Sooke’s booth has really stolen the show, people absolutely love it. Try out the Olympic line – an electric streetcar (with comfy leather seats!) on loan from Brussels, Belgium – and you thought sprouts were the attraction from Brussels. It runs from Olympic Village Canada Line station to Granville Island, where you can take in even more Olympic fun, including House of Switzerland, and Atlantic Canada House. I had an awesome, exciting weekend and didn’t spend a lot of money. Transit is cheap and reliable, and with so much free stuff to do, you’d be remiss not to take it all in.